In the recent past, we had a requirement where we needed to get the data analytics for our site. We had our site deployed to various environments for different clients and we had to extract useful data, such as the users who had logged in on a certain day, or the volume of users in different locales, so that our marketing team could create and adjust their strategies accordingly. We explored various approaches, and settled on the Elastic Search data store, which is a free and open source. It’s very easy to use, as it provides the most powerful capabilities for text search because it’s built on top of Lucene. We had the challenge to get the data analytics from different environments, so we created a scenario where a user has dashboard that they can update to add different charts/graphs at runtime, which provides them with different types of data. For example, the user can search for the active/inactive/logged-in user count or any other type of count from the system by simply changing the type from user interface and then the data should be readily available. Also, the user should also be allowed to write their own questions, and that data should also be indexed in the database so the user can see the question result in the form of a graph on their dashboard. Elastic Search makes this possible by allowing us to create indexes at runtime, as well as allowing dynamic search and full text search that is well-suited to our needs. Elastic search was first released in February 2010, and is a free and open source distributed inverted index created by Shay Banon. It is developed in Java, so it is a cross-platform. Elastic Search is built on top of Lucene, which is a full-featured information retrieval library, so it provides the most powerful full-text search capabilities of any open source product. Elastic Search is document-oriented. It stores real world complex entities as structured JSON documents and indexes all fields by default, with a higher performance result. Elastic Search implements a lot of features, such as customized splitting text into words, customized stemming, facetted search, and more. Elastic Search is schema free—instead, it accepts JSON documents, as well as tries to detect the data structure, index the data, and make it searchable. Elastic Search is API driven; actions can be performed using a simple Restful API. Elastic Search records any changes made in transactions logs on multiple nodes in the cluster to minimize the chance of data loss. Auto-completing a search box on partially-typed words, which are based on previous searches. Elastic Search is generally fantastic at providing approximate answers from data, such as scoring the results by quality. Finding approximate answers is a property that separates elastic Search from more traditional databases. Cluster: A cluster is a collection of nodes that hold data. It provides indexing and search capabilities across all nodes and is identified by a unique name. Node: A node is a single server that is part of the cluster, stores the data, and participates in the cluster’s indexing and search capabilities. Index: An index is a collection of documents with similar characteristics, such as customer data or order data. It’s like a relational database, with mappings that define multiple types. Type: There can be multiple types within an index. For example, in our application we have the GetCount index, which has different sections like active user count and inactive user count. Document: A document is a basic unit of information that can be indexed. It is like a row in a table in a relational database, such as data for a customer or product, and is described in JSON format. We can have multiple documents in an index, but they must be indexed to a type inside of an index. Shards and Replicas: An index can potentially store a large amount of data exceeding hardware limits. Elastic Search provides the ability to divide indexes into multiple pieces called shards, which allows the content to scale horizontally. Elastic Search also allows users to make copies of index shards, which are called replicas. 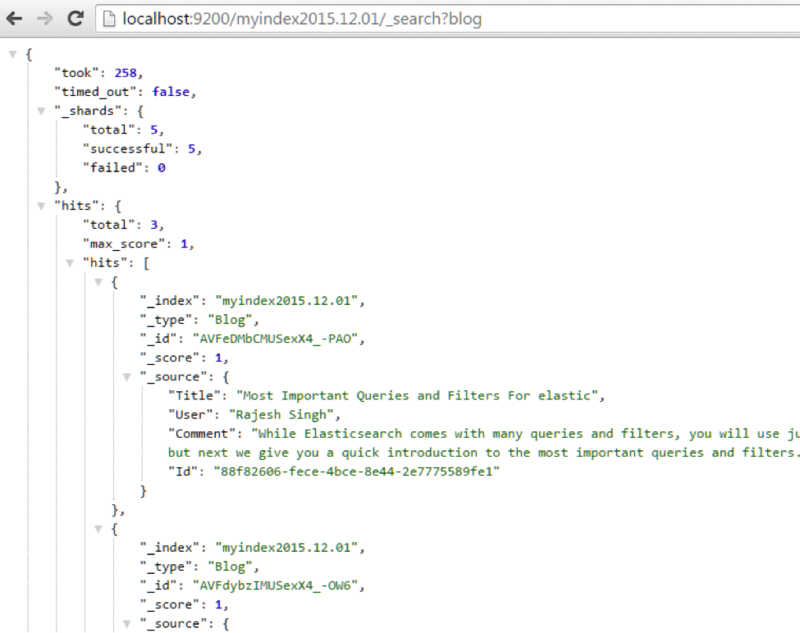 Let’s start with creating an Elastic Search client instance. Elastic Search runs on localhost:9200 by default, so we have created an instance by passing the URL. Now we can add as many indexes as we want with this Elastic Search client object. We have created a function to add an index with a unique name and type. We added a unique name so that it will be easy to find when the daily scheduled job logs data, and we have defined the type as blog, which is equivalent to a table in a relational database. Our index has been created successfully. Now we’ll look at some examples of different searches on the index. The default match query is of type boo, which means that the text provided is analyzed and the analysis process constructs a Boolean query from the provided text. The operator flag can be set to “or” or “and” to control the Boolean clauses (defaults to or). So the above query is an exact match query with a must clause (and). You can also use a should clause that is equivalent to “or” operator. In the following example, we have shown the search on multiple fields with an “or” clause, so the query should be a Boolean query with a “should” clause. We are matching with a “should” operator in the Boolean query, so either the title or the comment should be a match. You can easily update or delete a document in an index with the following operations. Elastic Search offers a highly useful plugin mechanism as a standard way for extending its core. Plugins enable developers to add a new functionality. There are several plugins available like BigDesk, Head, HQ, Kopf, and Paramedic. Although Elastic Search is a powerful tool, there are some disadvantages to it. A major concern is security, because it doesn’t provide authentication and has no support for transactions. Elastic Search is also relatively new, so it hasn’t had time to develop mature client libraries and third party tools, which can make development much harder. Elastic Search is distributed and fairly stable, but backups and durability are not as high a priority as they may be for other data stores. This is important to keep in mind if you are planning on using it as a primary store, because you could lose your data. Chavi Gupta is a Technical Lead at 3Pillar Global. She brings with her over 9 years of development and design experience in several competencies based around Microsoft technologies. She has extensive experience working in Travel, E-commerce, CMS, and Health domains. She loves designing new apps, learning upcoming technologies, and also loves to spend her spare time traveling to new places with family and friends.